This fast paced program demonstrates how proven principles of retail development can be combined with the best practices of New Urbanism, Smart Growth, and architectural design to create successful and competitive mixed-use urban commercial centers. Ideal for developers, planners, investors, retailers, architects, and public officials, the program focuses on several topics, among them the required market demographics for various retailers, restaurants, and shopping center typologies including convenience centers, neighborhood centers, power centers, regional malls, and lifestyle centers. The impact of consumer psychographics and techniques for creating place-based brands will also be presented. 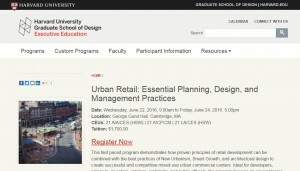 Instructors focus on the actual nuts and bolts of how to program, plan, and design competitive retail in historic downtowns, underperforming shopping centers, and new ground-up developments as well as repairing failed suburban centers. The course covers market research, branding, national retailer criteria, and site-selection principles. Participants will learn about streetscape, store planning, signage, tenant mix, merchandising plans, leasing, anchors’ roles, and successful new urban planning techniques, design criteria, parking, building, site planning, and developer requirements. The course will also review the synergy among residential, office, civic, and governmental land uses and retailer performance. The instructors illustrate the strengths and weaknesses of many leading town centers built during the past 20 years. Discussions of trends and techniques for vertical integration of non-retail uses as well as retail storefront design trends and techniques will be featured, and the instructors will share inside secrets for shopping center planning and design and applications for cities and new towns. Also taken into consideration will be the integration of big-box discount retailers in the city and new town centers. Lessons learned from leading U.S. urban retail developer, Yaromir Steiner. Lessons learned about creating timeless and sustainable buildings, neighborhoods, and towns from renowned architect Stefanos Polyzoides. An overview of Robert Gibbs’ book, Principles of Urban Retail. A look at the hot urban tenants for 2016. Case studies for top urban town centers and historic downtowns. Explore planning and design techniques for revitalizing historic town centers and building new mixed-use town (lifestyle) centers. Review the rise and fall of American cities as regional shopping destinations. Apply nuts and bolts techniques for increasing retail sales through streetscape, parking, signage, and pedestrian movements. Examine a successful New Urbanist model for integrating retail into existing historic downtowns, new developments, and suburban retrofits. Gain an insider’s understanding of leading retailers and department store business models and site selection criteria.